For our forth installment of the "Gaps of Gay Street", and a follow-up to the 200 Block East side, we'll cross Gay Street to the west side. Much like the east side, the west side would not really begin to develop until the late 1880's. Unlike the east side, the west side buildings were much smaller and housed smaller concerns like clothing stores and shoe shops. What is perhaps the most interesting building on the block belonged to this man: Cal Johnson. 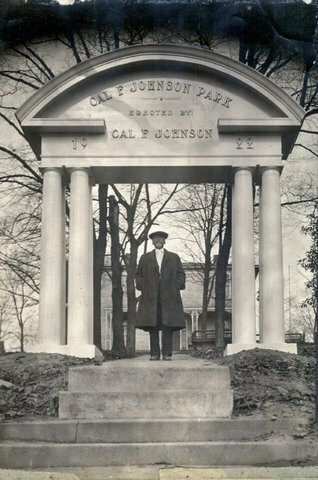 Cal Johnson, in his park. Cal Johnson was born in 1844 into slavery for the McClung family. His mother was owned by Charles McClung and his father by Hugh Lawson McClung. After the civil war, however, Mr. Johnson went on to become one of the wealthiest men in the city and one of the wealthiest former slaves in the nation. He was a successful business man, best covered by Jack Neely in this article here. His first pursuits were in the saloon business. He purchased his first saloon, The Poplar Log, at the corner of Central and Vine in the 1890's and then shortly opened this place, The Lone Tree Saloon, naming it after the last tree standing on Gay St. at the time. Cal Johnson's Lone Tree Saloon and the "Last Tree on Gay Street". The Lone Tree looks much like you'd expect a saloon to look, small and cozy.The Lone Tree catered to white clientele and was wildly popular until it was shut down by a city prohibition ordinance in 1907. Looking at the west side of the block, from a much loftier perch on the east side, one can see how it started out much smaller than the east side. We can speculate that may have been because of the large hill behind the block limiting the size of the buildings. Whatever the case, that side of the block took longer to grow. An 1890's view of the west side of the 200 block of Gay Street. West side of the 200 block in the teens. By the 1900's the block was beginning to take on a more purposeful look. We can see in the above photo that the clothing, jewelry and shoe stores that would be the hallmark of this block had begun to open. Perhaps the most interesting aspect of this photo is something that is still there. Notice "Liggetts" on the adjacent block? That building is still there albeit almost unrecognizable. It now houses Knoxville's visitor center where you can catch the daily "Blue Plate Special" on WDVX. Shoes can be had for $3 at Dixie Shoes. The 200 block in the 1920's. Note the "1875" is missing and the Lone Tree is gone. The above photo shows us the 200 block evolving into the 1920's. 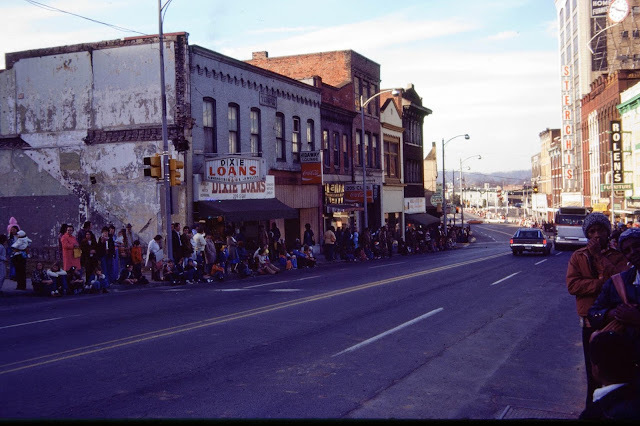 Present in this photo is the one mainstay on the block that would be there into the 1970's, "Moskins" clothing company. You'll note that there is now a 3 story building in the place of the Lone Tree Saloon. After Cal Johnson's saloons were shuttered by the prohibition ordinance, Mr. Johnson rented the building to a cobbler who had recently immigrated from Poland. He operated the Lone Tree Shoe Shop from that point until the mid-1960's. The cobbler, needing room to expand, tore down the Lone Tree and replaced it with this building in 1918. The tree itself made it until 1930, when it was finally euthanized by the city. Here we can also see that the hallmark of the East side has encroached on the west side, a loan and pawn shop. Loan and pawn shops would come to represent this block in the minds of several generations. Here we have Uncle Sam's Loans, later in the century Dixie Loans would take over as seen in the photo below. That same shot in the 1970's, everything from the Temple building north is still there. A very late photo of the 200 block west overlooking the destruction that was the Summit Hill project. The 200 block western side, having been demolished leaves us with this view today. 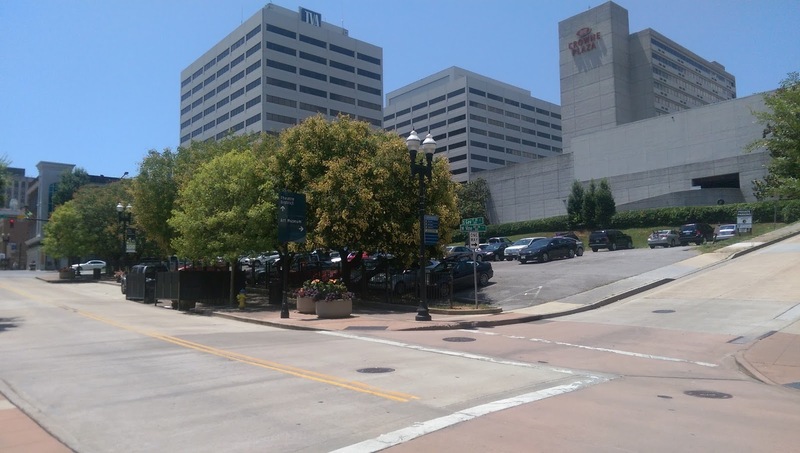 While the trees are pretty, think of how much more cohesive downtown would feel if the 100 block hadn't been severed from the rest of Gay Street. 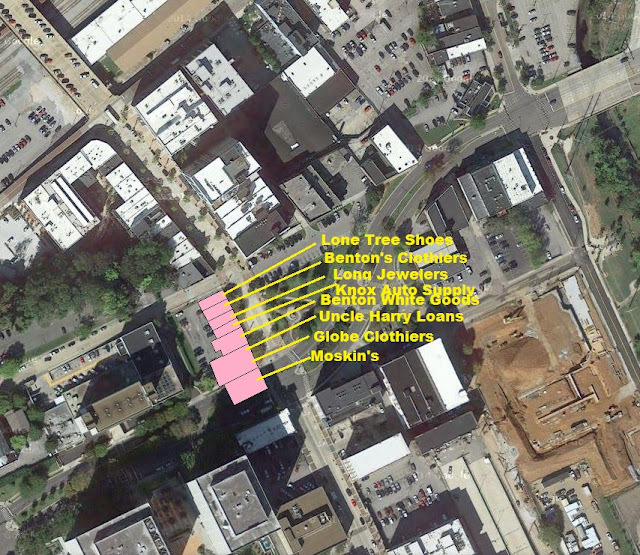 Below are some aerial shots showing the gap where Gay street was interrupted. Businesses on the block in 1935. Now it sits an empty parking lot. 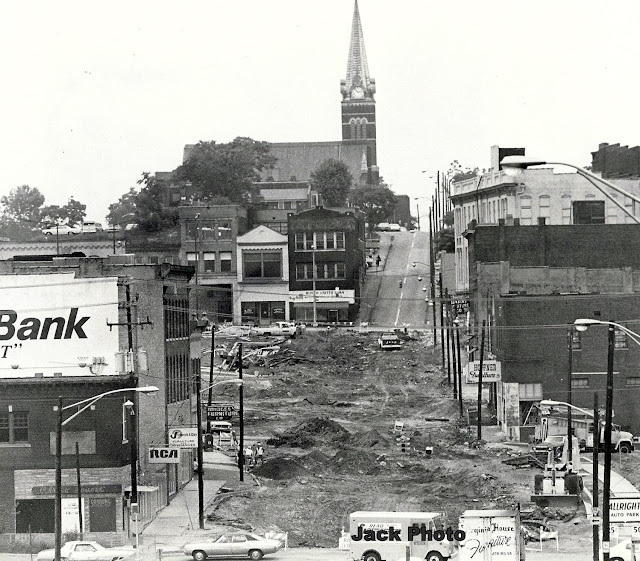 Unlike the East side of the 200 block, the majority of the West side survived the grand carve up that was the Summit Hill project. After 1976, most of the this side of the block was still standing. The Hideaway Lounge, Club 205, and a loan shop were all still in business. That would end in March 1982. The land had been purchased by KCDC for use as a parking lot for the new Quality Inn Hotel (now the Crowne Plaza). Currently the parking garage, which is attached to the hotel, is rarely full. KCDC still owns the land that used to be the 200 block west and maintains a large surface parking lot there. It's a shame that what could be a functioning block is still just a plain, empty lot. Until next time, when we move south back down Gay Street seeking to fill "The Gaps of Gay Street." I have been translating the 1930s journalism of Swiss writer Annemarie Schwarzenbach, which brought me virtually, via Google Streetview, to the Andrew Johnson Hotel in Knoxville, where she stayed in 1937, and wrote about Westfront Street, now (I'm presuming) Neyland Greenway and Avenue. Do you have any further details of that area near the river? Or any old photos, apart from Schwarzenbach's which are now at the Swiss Literary Archives. Greetings from Switzerland. I enjoyed your site. Check out Cormac McCarthy's SUTTREE No pictures, but a good read of Neyland Drive area. My Husband(who is deceased)father owned Comer's Pool Hall on Gay Street. like to know if you enjoy the book!! Also I just found a piece of jewelry from MaskallS 217 gay Street Knoxville the picture of the jewelry store is shown in this article. taking it to see just what it IS!! I find it extremely disappointing how much of Knoxville has been destroyed. So much of our history is gone forever. It amazes me how many bad decisions have been made throughout the years. It’s almost like the city planners were trying to destroy history. Parking lots and condos now occupy the spaces where beautiful buildings used to be. The most unbelievable thing is that they put interstate 40 right through downtown because people like Regas and Dempster wanted to make sure their businesses weren’t bypassed. Decisions like that created “Malfunction Junction” and traffic is still a nightmare through there. Many poor decisions have damaged our city. 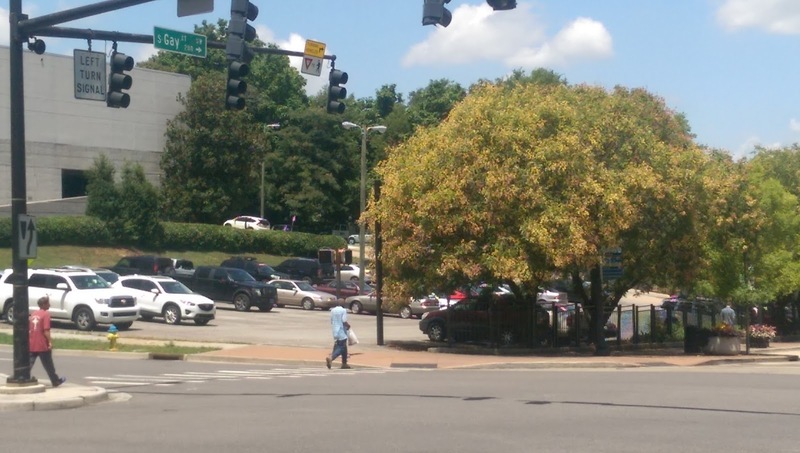 Knoxville would be a much more attractive place if things were done differently.